A tapestry of grand stature, this work "Versailles Promenade" shows the beautiful gounds of Versailles palace. Designed by Charles Le Brun in the mid 17th century, this tapestry is an example of the creations that the Manufacture des Gobelins, the illustrious tapestry factory in Paris during the reign of Louis the XIV. This tapestry factory produced a large number of tapestries required in the royal palaces to decorate it. The palace itself is in the distance, and the gorgeous promenade that leads up to the palace is shown with royalty and ambassadors strolling the grounds, and a foreground of fruit trees, and a basket overstrewn with fruits and flowers. Charles Le Brun was the most decorated and sought after artist of his time and awarded the position of First Painter to the King in 1662. The production from the Gobelins factory under the supervision of Le Brun was said to have produced some of the most beautiful tapestries of French history. 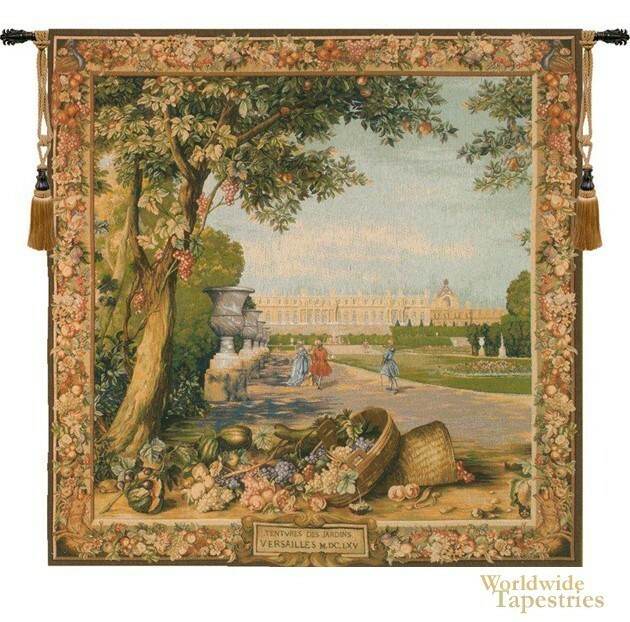 This tapestry "Versailles Promenade" is backed with a lining and has a tunnel for easy hanging. Note: tapestry rod and tassels, where pictured, are purchased separately.